Thread: How much time will it take for my scrubber to work? I am new to scrubber, first of all it is an honour to be here at the forum with you guys, it is of much help reading your articles and posts. -16x20 cm, only one side, made inside an acrilyc box. 2 Cree 660nm Photo Red, 1 Semiled 420nm Deep Blue, 2 Reds 630nm, 2 Full Spectrum leds. The last four will be replaced by Cree 660nm and Semiled 420nm also, but right now I don't have the Crees and started with the red and full spectrum. My Aq is 180L net water, very low bioload (2 fishes and some small corals), have a very big skimmer (rated for 700L), Act. Carbon and PhosphateMinus to reduce PO4. My NO3 went from 5ppm to an absolute 0 as soon as I turned on the skimmer, I am not testing PO4 right now, but a Hanna PO4 test is on it's way to my home. However, I have some very green nasty hair algae on the upper center of my display, on the reef rocks, and I want them out of there! The tank is aimed to be for SPS, with low nutrients, and the small frags I purchased a month ago turned super colored as soon as I introduced them to the tank. Scrubber started working one week ago, how much time time do you think will it take until I can see algae on it, and the reduction of my hair algae on the display? How old are the rocks? The whole system has 3 months, just finished the diatoms part, they are totally fading away. I will put pictures as soon as I can. Rocks are all fiji and pukani and has been wiped out with bleach and then dried under the sun for 2 months. All rocks are the same on the system. 3 month old since I started the system. Because you bleached, the dead microbes are stuck inside the rock, and will slowly dissolve in the aquarium. So, algae will increase on the rocks for a few months, then will decrease. Thank you SantaMonica, I will wait then, I did not know that. 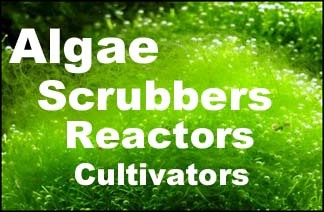 Besides that, what is the estimated time for a scrubber like this to start showing some algaes? A week or two for light brown growth, on a new tank. Today I removed the net to see how was doing it, and I could see a very small trace of brown algae, so I think it is doing ok.